One is known as Dr. Humble, The Bridge and Dr. Perfect. The others are credited with “perfection” in the Granville-based restaurant business they launched. In the first case, the nicknames were assigned to Dr. John Weigand, medical director at the Kendal at Granville retirement community. 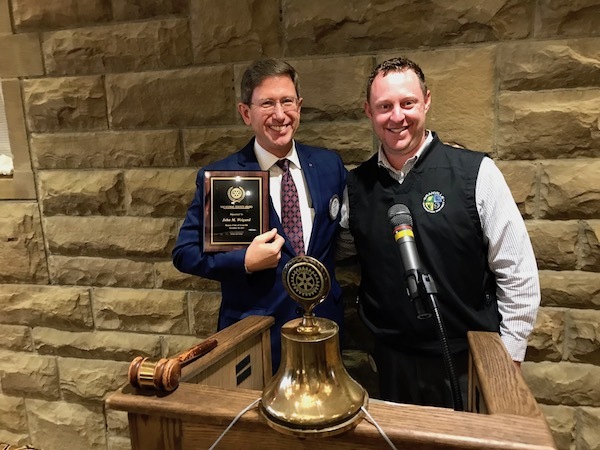 He, along with entrepreneurs Chuck and Lisa Whitman, shared the 2017 Vocational Service Award given annually by the Rotary Club of Granville. 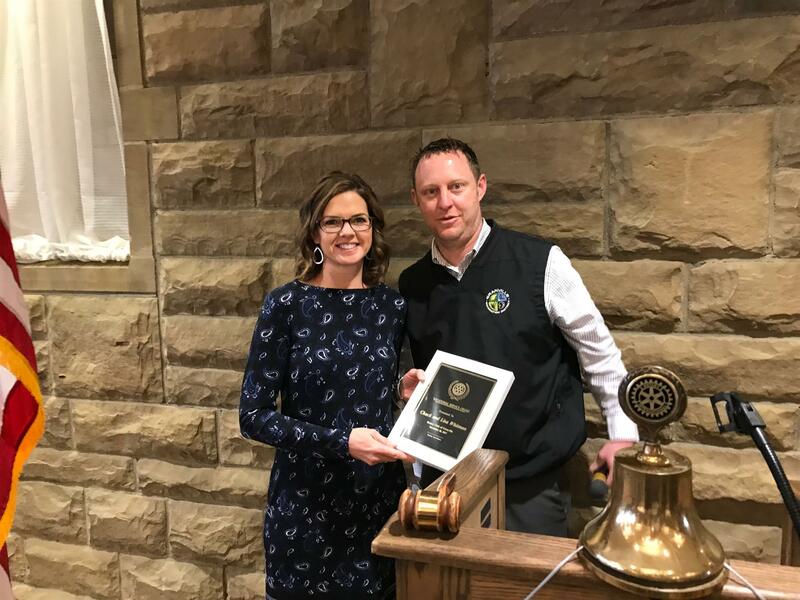 Marla Krak, Marketing Coordinator with Whit’s Frozen Custard, accepts the Rotary Vocational Service Award on behalf of recipients Chuck and Lisa Whitman, founders of Whit’s, from Rotary President Andy Wildman. The award has been given since 1993 to either a Rotarian or non-Rotarian who exemplify Rotary’s “second avenue of service” that encourages and fosters high ethical standards in business and professions. Weigand, president of Central Ohio Geriatrics and Chief Medical Officer of National Church Residences, was nominated for the honor by Rotarian Katy Paumier, who works with Weigand as part of her medical management business. “I work with over 50 physicians and none of them have the dedication, high ethical standards, high caliber of professionalism and high level of compassion and concern,” Paumier said in her nomination letter read during the Nov. 20 presentation. “You will often see his office lights on late into the night as he prepares for his next talk, handles a medical emergency, has an empathetic chat with a patient’s family or contemplates how the country is going to take care of the needs of the rapidly growing population of aging adults,” Paumier’s letter added. Amy Martin, vice president of operations for Central Ohio Geriatrics who has worked with Weigand since 2009, said that “above and beyond” does not begin to describe the level of patient care he provides. “Having worked in senior living for 25 years, I can attest that John’s compassion toward older adults as a physician is unmatched,” Helman wrote. Kendal resident Dave Skeen said he and wife Becky quickly became friends with Weigand since their arrival in 2010. The Bridge? Paumier’s nickname for Weigand reflects his dedication as a former Rotary president in getting the seven-year Rotary bridge project completed over Raccoon Creek to link the T.J. Evans Bike Path in Granville to Raccoon Valley Park. Weigand credited his wife, Jan, his entire family and many mentors for his successes. “I’ve pretty much had a clear path to do what I do,” he said. Rotarian Chuck Peterson emphasized the Whitman couple’s connection to the soft serve ice cream industry as youths — knowledge that led them to establish Whit’s as a frozen custard outlet. Chuck Whitman worked in a dairy manufacturing plant where he gained greater insight into which ingredients made ice cream so delicious, Peterson said. “Over the years he became convinced that with proper ingredients, frozen custard could become a popular choice of many customers,” Peterson said. He said that after experimenting with a variety of ingredients, they believed they’d found “perfection” in their Granville store, which first opened in March 2003 and eventually expanded into a central Ohio chain and into five other states.